Keys Federal Credit Union ($130.6M, Key West, FL) faced a trifecta of trouble during the late oughts. A difficult board, the Great Recession, and a natural disaster left the credit union. In September 2009, four of the seven board members of Keys FCU signed a voluntary conservatorship order, which effectively removed the board members from their positions and instated the NCUA as the credit union’s board and supervisory committee. Rather than immediately find a merger partner or dissolve the credit union, the NCUA let Key FCU’s management try to turn things around at the small Sunshine State cooperative. That’s when the credit union went into recovery mode. It continued cost-cutting efforts it had implemented in 2008 and focused on increasing retained earnings. To save the credit union — and their jobs — required staff members to come together. It was all on the line, and they only had one chance to get it right. In this Q&A, Scott Duszynski, president and CEO of Keys Federal Credit Union, discusses the events that led to the credit union’s voluntary conservatorship. He also explores how the organization steadily rebuilt its financial condition while developing stronger relationships among staff, regulators, and the community. Why did Keys FCU opt for the voluntary conservatorship route? Scott Duszynski: We had three rather large issues we had to deal with as an organization. The first was a board of directors that had a different vision for the credit union. It’s damaging when a clear path forward can’t be agreed upon, and that was the situation here. Click through the tabs below for a deeper dive into Keys FCU's financial performance. Then, click on the graphs to visit Peer-to-Peer Analytics by Callahan & Associates and compare your credit union's performance against Keys FCU or any peer group of your choosing. 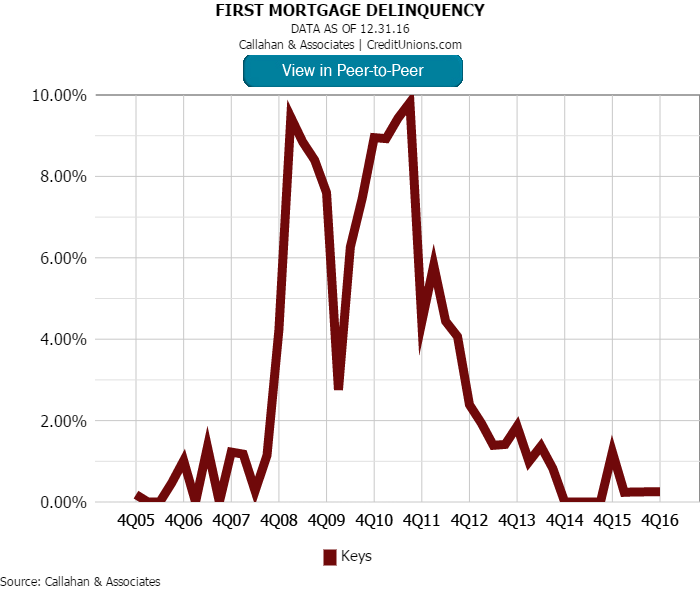 The housing crisis was one of the three major issues Keys FCU had to deal with in 2008 and 2009. IN the credit union's hometown of Key West, FL, the losses on real estate alone were substantial, says CEO Scott Duszynski. After Hurricane Wilma hit in 2005, the credit union initially saw an uptick in loan volume as a result of the flooding. But the nation was in the midst of the Great Recession three years later, when consumers generally replace cars, and members opted to hold on to their vehicles. 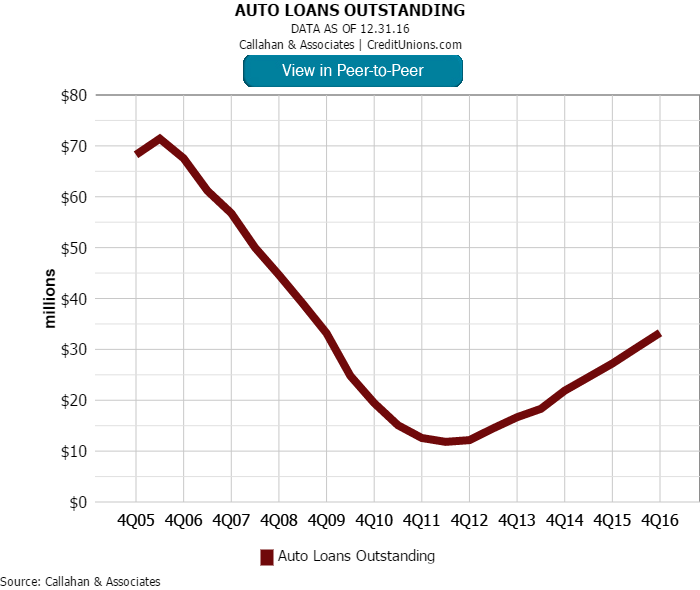 The lack of loan demand had a deleterious effect on the auto portfolio. Even before Keys FCU went into voluntary conservatorship in 2009, it had already instated cost-savings measures. Unfortunately, the credit union had to take measures such as reducing staff and cutting benefits. 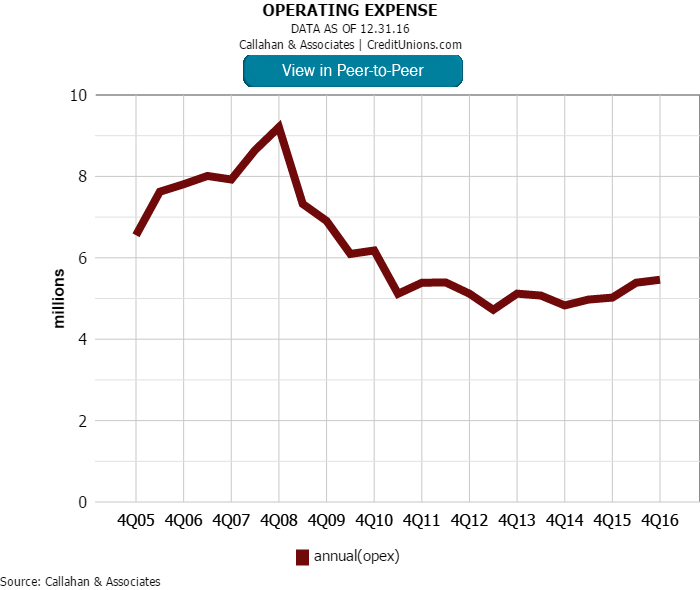 But operating expense have held steady for the past five years. We also had to deal with the housing crisis. In Key West, the losses on real estate alone were substantial. For example, the value of my own townhouse purchased in 1999 for $148,000 soared to an appraised value of $619,000 in 2005 before plummeting back down to $180,000 during the financial crisis. The third event was Hurricane Wilma in 2005. The credit union initially saw a surge in loan volume as a result of the flooding — 70% of our auto portfolio turned over in three months due to damaged vehicles — but the long-term impact was negative. Typically, members get new cars approximately three years into a loan, but the majority of our loans hit that mark in the 2008-2009 timeframe when most members were choosing not to get a new vehicle. This had major consequences for us as normal amortization dropped our loan income and there was no new loan demand on the horizon to replace it. All three of these events led our board to put the credit union into voluntary conservatorship in September of 2009. What changes did the credit union make after the conservatorship? SD: Obviously, the only way to build back capital was through income, so we immediately ramped up our cost-cutting efforts. This meant downsizing staff and cutting benefits like 401(k) matching and incentives. In March 2011, we found out the building that housed our main office was being sold. We had no choice, we had to leave. We got into a new space and renovated it in just 96 days. Also in 2011, the regional director of NCUA asked me if I wanted to move from CFO to CEO. I decided the only place to go as an organization was up, so I accepted the challenge. What other changes improved the financial position of the credit union? SD: We combined two of the branches in Key West into our new main office. We also closed one branch further up the Keys with the intention of re-opening one day when we became profitable again. The cost-cutting measures were the first piece, along with finding a stable home for the main office. Once that was done, we focused on growing loans to get the income flowing again. Leaders, at any level, need to understand that people are paying attention. If you have a sour face or a smile, they are watching and will respond in kind. At the time, we had a consumer loan goal of $600,000, and I can remember some of the staff thinking that was a stretch. Today, our monthly goal is $2.8 million, and the staff regularly beats it. The production is there now, but it took a lot of work to get there. We advertised quite a bit, but immersing ourselves in the community was even more effective. We’ve done that primarily through volunteer projects, event sponsorship, and being active throughout the community. Our 35 employees completed more than 550 hours of community service in 2016. And this includes only official credit union events. It doesn’t include senior staff members serving in Rotary clubs, chambers of commerce, military affairs committees, The Navy League, Toastmasters, etc. We got out there, and it has paid off. The community started talking about the credit union and relating to us as their community financial institution. Getting out into the community has helped Keys FCU make a financial comeback. Its 35 employees completed more than 550 hours of community service in 2016, underscoring its role as the community’s financial institution. How did you keep staff motivated? SD: The most important thing, which I didn’t realize made such an impact at the time, was walking around and checking in with everyone. Simply smiling and asking “How is your day going?” can make a big difference and encourage staff to move forward even when times are tough. Leaders, at any level, need to understand that people are paying attention. If you have a sour face or a smile, they are watching and will respond in kind. The only financial incentive we had was, if we hit the goal for the month, we’d allow staff to buy lunch up to $15. A few years ago, we put in a super goal worth a night at the credit union with bingo, pizza, sodas, and prizes. The prizes consisted of a few gift cards, but the staff loved it. We also did Halloween dress-ups and potlucks with the senior executives. There were five senior executives at the time, and we’d make breakfast for the employees when we had monthly team meetings. That was a big hit as well. You’ve got to find what works for your organization. Like what you're learning? Callahan's Media Suite subscription provides even deeper insight to help credit unions thrive with enhanced access to CreditUnions.com and industry-specific print publications. What is your advice for building, and maintaining, a strong relationship with regulators? SD: We’re all here for the same purpose, and, ultimately, we all want the same thing. The NCUA doesn’t want the credit union to fail; they want to see the organization do well and help the members. Both parties have that shared purpose in common. How we go about achieving that is different, but being open to conversation and new ideas is helpful. Don’t go into meetings with the NCUA with an attitude that you know everything and they know nothing. They have ideas that are good and some that might not be — but credit union executives are the same way. We’re all people, and if you work together you can get a lot accomplished. One of the best things about the conservatorship is that we got to experience exams from other regions. Since our own region of the NCUA was overseeing the credit union during the conservatorship — and couldn’t examine themselves — outside examiners performed our exams. That process was invaluable as everyone does things a little differently and we were able to pick up some analysis tools that were quite useful. How did Keys FCU rebuild its board? SD: In the summer of 2013, the NCUA started thinking about re-establishing a board and went to our membership base to see who might fit the profile of a board member for a financial institution. They looked at some long-term members and found a cross-section of representatives from the membership who were leaders in the community. 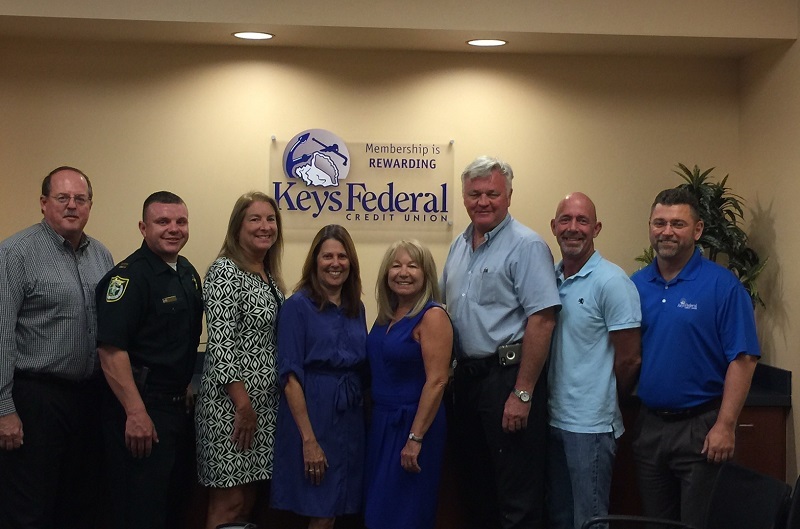 Keys FCU’s new board represents a cross-section of members who are also leaders in the community. Its members underwent a vetting process and completed training before becoming a full-fledged board in 2015. Each of the new board members went through a vetting process. At first it was just an advisory board so they couldn’t make decisions. But they went through an extensive training process with NCUA, NAFCU, and the league. We also had internal training that went on until we were released from conservatorship in September of 2015. The onboarding period from the summer of 2013 to September of 2015 helped the new board gain needed knowledge and skills and gave us an opportunity to interact with one another. The NCUA then released us from conservatorship during one of our regularly scheduled board meetings. The NCUA start the meeting by saying, “Congratulations. This is your board meeting now.” The new board took it from there and didn't miss a beat.